In September Rhys Chapman launched a campaign on the crowdfunding website Kickstarter to raise the production budget for a short film project. His dream was given a huge boost when Lord of the Rings star Sir Ian McKellen agreed to lend his iconic voice to the pilot film. 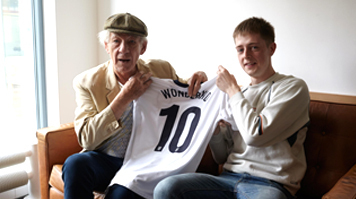 Rhys first approached Sir Ian whilst attending the Pride in London march earlier this year. After briefly explaining his vision for the project, the big screen star was so impressed that he offered to record the voiceover. Rhys' short film - entitled Wonderkid, will follow a young professional football player coming to terms with his sexuality and searching for acceptance in a hyper masculine environment. The film will aim to challenge the perceptions of athletes and highlight the pressure they face living up to the identity society has created for them. Rhys said: "It's an honour to receive support from such influential and admirable individuals. Without their backing and the knowledge I received at LSBU, my vision would not have come to life so soon and I am truly grateful." Rhys' passion for film began whilst he was studying Arts Management at LSBU. Throughout the course, Rhys had a work placement with LAW magazine which gave him the opportunity to direct and edit films. After graduating, he began work to with a small production company based in Soho, assisting the production of music videos and commercials for brands such as Sony and Sofa.com as well as record labels such as Southern Fried Records; Eton Messy Music and Freestyle Records. He added: "Studying at LSBU allowed me to gain both theoretical and practical knowledge of the creative arts industry. Many graduates leave university with a substantial knowledge of theory but a lack of practical experience. I left LSBU with an abundance of both. "The Arts Management work placement units enabled me to gain valuable practical experience whilst studying. My work placement gave me the experience I needed to learn about the film industry with the theoretical modules giving me the knowledge behind the creations."